Subject: Granting over draft of Tk. 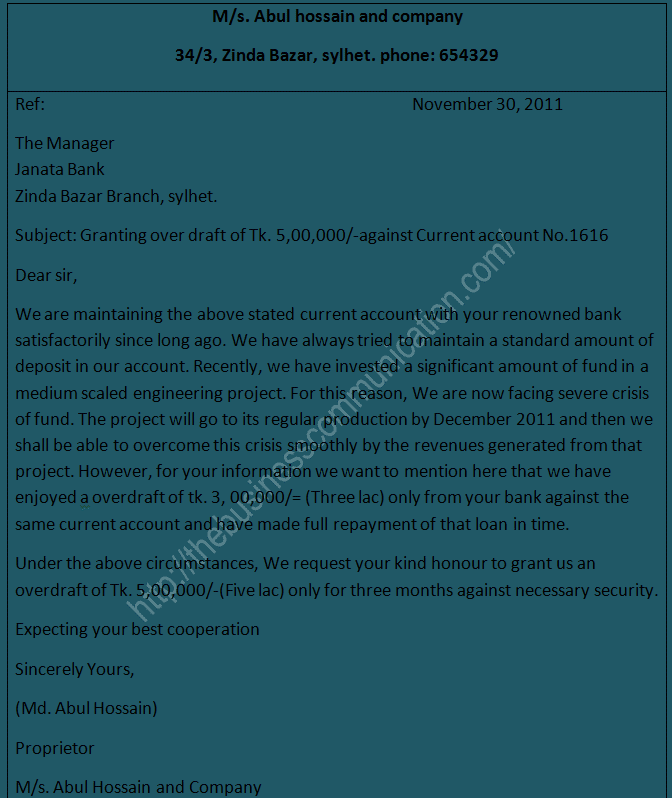 5,00,000/-against Current account No.1616. We are maintaining the above stated current account with your renowned bank satisfactorily since long ago. We have always tried to maintain a standard amount of deposit in our account. Recently, we have invested a significant amount of fund in a medium scaled engineering project. For this reason, We are now facing severe crisis of fund. The project will go to its regular production by December 2011 and then we shall be able to overcome this crisis smoothly by the revenues generated from that project. However, for your information we want to mention here that we have enjoyed a overdraft of tk. 3, 00,000/= (Three lac ) only from your bank against the same current account and have made full repayment of that loan in time. Under the above circumstances, We request your kind honour to grant us an overdraft of Tk. 5,00,000/-(Five lac) only for three months against necessary security.